Admission is always free (though donations are always welcome!). 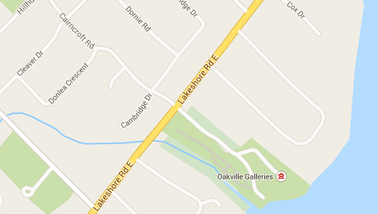 WHERE IS OAKVILLE GALLERIES LOCATED? Oakville Galleries is 30 km west of Toronto. We're housed in two spaces—one alongside a public library in downtown Oakville, and another in a lakeside mansion and park. Oakville Transit offers an on-demand transit service called Home to Hub that will conveniently pick you up or drop you off at our Gairloch Gardens location from the closest transit hub (Oakville GO Station or Downtown Oakville). 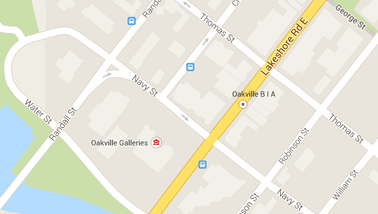 Service is open to anyone travelling to or from Oakville Galleries; regular transit fares apply. Advanced registration is required. Once you're registered, trip bookings can be made between two hours and ten days in advance. For more information and to register, please visit oakville.ca. Ride sharing services are also available in the area. Zipcar vehicles are available at the Oakville GO Station. To learn more, please visit zipcar.ca. Parking is available in the main Gairloch Gardens lot on Lakeshore Road East. A limited number of spots are also available adjacent to the gallery entrance on weekends. Parking is free of charge. There is paid parking available in the lot on Water Street, at the rear of the building. Rates are $1.50 per hour from Monday to Saturday, 9:00 am to 6:00 pm. Parking is free outside of these times. Bicycle racks can be found at both locations. GO Train and Oakville Transit are both bike-friendly during most times of day. ARE THE GALLERIES WHEELCHAIR ACCESSIBLE? All public areas of the gallery are wheelchair accessible. Unfortunately, the entrances are not equipped with automatic openers. A single user restroom is located on the main level, however it is regrettably not wheelchair accessible. The gallery and all public spaces are fully accessible. An elevator connects visitors to all levels of the library, with accessible restrooms on the second floor. Service animals welcome at both spaces. Strollers are permitted at both locations. Depending on the works on view there may be areas where their use is restricted. If you have any questions prior to your visit, please call 905.844.4402. IS THERE A CAFÉ OR RESTAURANT AT THE GALLERIES? Artists, we love you! Unfortunately, we do not accept unsolicited submissions. We are, however, happy to receive invitations, publications, links, or other bulletins from artists, curators and colleagues. If you are interested in showing your work in the community, the Queen Elizabeth Park Community and Cultural Centre welcomes proposals from local artists and curators. For more information, please visit oakville.ca. DO YOU APPRAISE WORKS OF ART? We do not. To find a certified appraiser, please visit the International Society of Appraisers Canada. HOW CAN I DONATE A WORK OF ART TO OAKVILLE GALLERIES? Oakville Galleries has long benefited from the generosity of the public in building our collections and we continue to welcome donations of art. Not every object, however, is right for our collections. If we already have a work that an offered gift duplicates, or if a work would never have a chance to be exhibited, we are generally not able to add it to our collection. Therefore we have a careful process for reviewing all proposed gifts. If you wish to offer an artwork to us, please send images, along with a letter outlining your intentions, to curatorial@oakvillegalleries.com. We appreciate your generosity. DOES OAKVILLE GALLERIES HAVE A PERMANENT COLLECTION? Yes, Oakville Galleries has over 1,100 works of art in its collection. We are committed to building a collection of contemporary art for and about the people of this community. Our holdings—spanning works in painting, sculpture, drawing, photography, film, and other media—include works that directly address Oakville's history, industry, populations, and ongoing state of growth and change, as well as broader issues of the environment and the changing face of the Canadian landscape. View the entire collection online. WHERE IS THE PERMANENT COLLECTION LOCATED? While we regularly integrate these works into our programming, most items are held in storage. Collection items are also loaned to major institutions across Canada and exhibited throughout public spaces in the community. Explore the collection online. We offer free guided tours on the second Saturday of every month. To learn more, please visit our current exhibition pages. If you would like to organize a private tour of our exhibitions, please contact Christina De Marchi at christina@oakvillegalleries.com. DO YOU OFFER RENTAL SPACE FOR PRIVATE EVENTS? The Studio in Gairloch Gardens is available for private rentals. Please visit our facility rentals page for more information and to submit a rental request. Regrettably, we are generally unable to rent the main gallery space for private functions. You are welcome to take photographs for personal, non-commercial use. On occasion, there may be certain works on view that cannot be photographed. Flash photography and tripods are not permitted. Any commercial photography must be scheduled and approved in advance. Photo requests can be directed to Victoria Arbour at victoria@oakvillegalleries.com. IS WEDDING PHOTOGRAPHY PERMITTED IN THE GARDENS? Yes. To obtain a wedding photography permit for Gairloch Gardens, please contact the Town of Oakville at 905.815.5989 or bookafacility@oakville.ca. Wedding photos are not permitted in the gallery space. HOW IS OAKVILLE GALLERIES FUNDED? Oakville Galleries generates much of its revenue through individual donations, corporate sponsorships, special events, education programs, and project grants. Oakville Galleries also receives ongoing, generous support from the Canada Council for the Arts, the Ontario Arts Council and the Corporation of the Town of Oakville. Couldn't find something? Send your question to info@oakvillegalleries.com or give us a call at 905.844.4402.